New Year's Resolutions - 2015! Does this dog look motivated for 2015? 'tis that time of year again… time to start writing down those resolutions! 2015 is going to be the year of doggy dental hygiene here in our home. 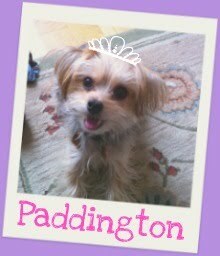 While Paddy has very good teeth for a dog of her age, we've decided to get really focused on preventative care. Fortunately for us, she doesn't mind having her teeth brushed - if anything it's really just getting in the habit of doing it 2-3x's a week. While we do still use a pet toothbrush, we've lately switched over to the Arm & Hammer Dental Wipes for quick in-between cleans. They're nice and small, and you can easily wrap them around a finger. Our second resolution is to be more vigilant about what we're feeding Paddy. Over the past year we've spent a lot of time looking at ingredient lists and the origins of her treats, and it's kind of scary. We're also not convinced that one-size fits all when it comes to dog food, which is why we've added a custom blend from Purina's JustRight brand to Paddy's diet. Not only do we love the transparency into the ingredients and where it's made, but we also love that we can customize her blend based on her activity level and needs. We're part of their pet blogger program, and really appreciate all of the info they've provided us with about the importance of a healthy diet for your dog or cat. What are your pet's 2015 pet resolutions? So, how much is too much to spend on a bed for your furry friend? Ringing up at $132.95 for the small, it's somewhat of an investment, but we kind of secretly know that Paddy would love it... and we are particularly enamored with the Madeleine, with its sophisticated (but girly) combo of pink and grey. That said, Paddy has kind of a similar setup now - though by no means as glamorous, which probably cost us less than $20 which seems to be just fine. 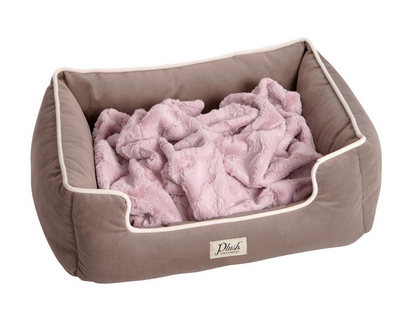 How much have you spent on your dog's bed? What is the most you would fork out? Share a snapshots of a pet on Royal Canin's Facebook page (www.facebook.com/royalcanin), Twitter @RoyalCanin or Instagram @RoyalCainUS. For each submission, 20 pounds of food will be donated and participants are automatically entered to win a one of twelve prizes from Royal Canin all month long. Visit www.banfieldcharitabletrust.org or one of the 870+ Banfield Pet Hospitals to make a food or financial donation to the Meals on Wheels pet food programs. For each monetary donation of $10 or more, KONG® will donate a toy to the pet of a Meals on Wheels client. Royal Canin is committed to making a 60,000-pound pet food donation this year, so start posting/tweeting/snapping those pics! 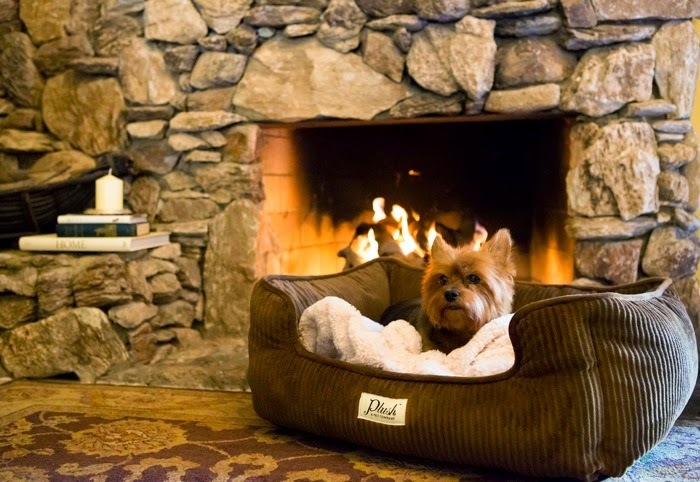 Stumped on what to get the very deserving pup in your life? Check out Paddy's 2014 holiday wish list for a little inspiration! At this rate, she's going to need a bigger stocking…. What could be more delicious than a bag of biscuits from Bocce's Bakery? Featuring all of the wholesome ingredients they're known for, and made in small batches, these treats notes of apples, cranberries and of course, peppermint! $9.50 for a bag, $15.50 for a tin, available from Bocce's Bakery's website. The name really says it all. This ultra luxury pet bench features a super soft and fluffy cushion for optimal napping and lounging. 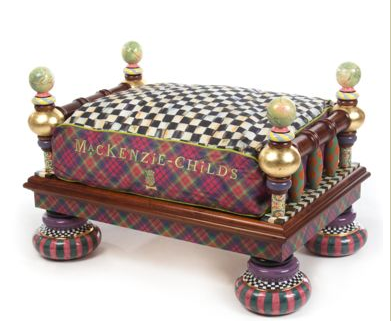 $2,975, available from MacKenzie and Childs website. 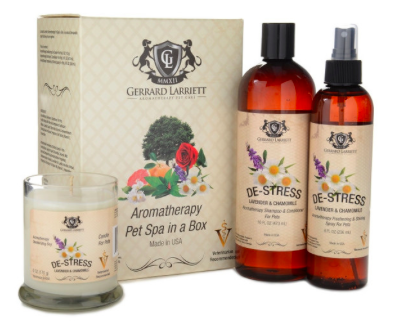 Available in delightful scents like Lavender and Chamomile and "Happy Jasmine," this set contains everything you need to create a day at the spa for the pampered pet in your life. Includes Shampoo/Conditioner, an aromatherapy candle, and an in-between bath spray. Available in a variety of scent sets ($39), and as individual products from PupLife.com. 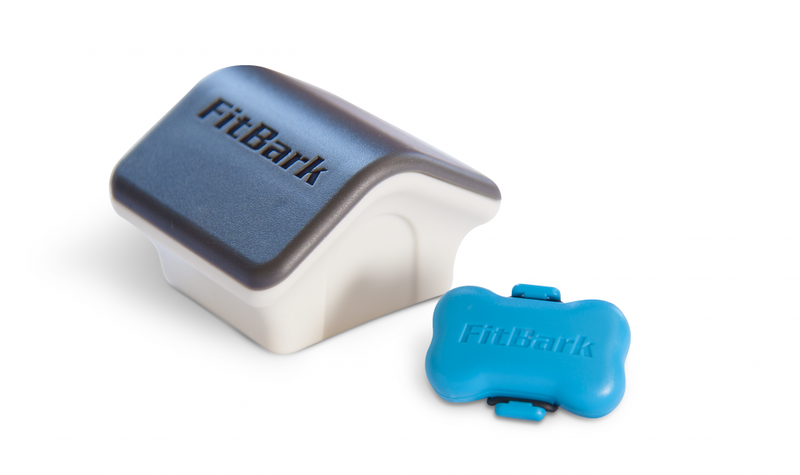 While it doesn't include a GPS, FitBark is a FitBit for your pet. Track and monitor your pup's fitness and activity, measure their progress and behavior against other similar dogs, and get real-time updates sent to your phone via their mobile app. While it has yet to hit shelves, you can pre-order yours now from FitBark's website for $99. There are very few toys in the Barkzilla residence that have stuck around for more than a few weeks. 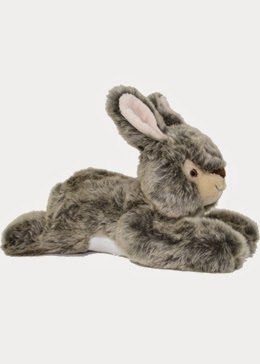 Walter the Rabbit is one of the much loved. Though he has since lost his squeaker, his seams have held up during many hours of tug of war and fetch. Walter and his friends are available for $19.99 from Barker and Meowsky. It seems like more and more dogs are flying the friendly skies these days! Paddy is now officially a member of the canine jet-set and done the cross-country trip twice! Traveling with your pooch for the first time can be a bit harrowing, so we thought we'd share a few tips in the hopes that they'll be helpful for others. 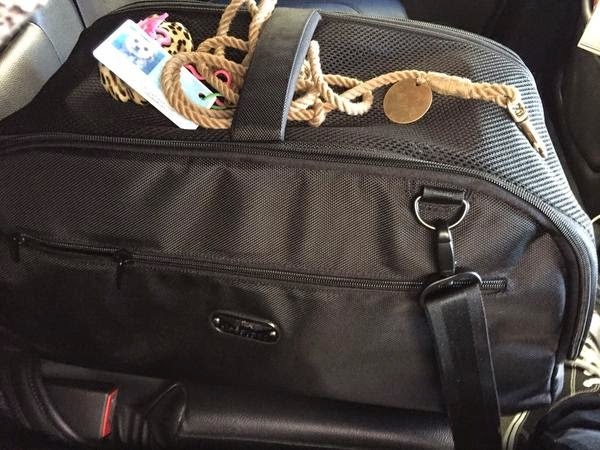 - An airline friendly, comfy carrier is a must. We absolutely swear by our Sleepypod Air (you can find our review here). Not only does it provide excellent ventilation and visibility, but it also comfortably fits under the seat in front of you, even if you're stuck in a middle seat (sighhh). Because Paddy is only around 6.5 lbs, there is also ample room for her to move, stretch and sprawl. The Sleepypod also comfortably fits over the handle of a rolling suitcase, which is extra handy when you're juggling tickets, bags and an ID at the airport. - Lookup your airport's pet relief areas in advance. We went all 1990's and even printed them out. Seriously, so clutch. - Lookup your airline's pet restrictions/rules/regulations. Fact: if you are flying first class on planes with lie-flat seats, your dog CANNOT sit next to you. This may cause both you and your pup anxiety… thus it's a good idea to check this out in advance. - Make a reservation for your pet. Most airlines require you to call in advance and make a reservation for your pet as there is a limit to the number of animals allowed in the cabin. - Treats. We selected some of Paddy's favorites to keep her happy on the journey, just make sure to choose something that does not create a huge mess, or generate a lot of thirst. - Hydrate. While guzzling water before a 6 hour flight is probably not a great idea, make sure to pack a little travel bowl to help keep your pup comfortable. - Wipes, extra bags, etc. We filled a giant ziplock with extras/backups of things that we may need in case we got delayed. Keep it in your carry on bag. And finally, it never hurts to talk to your vet. If you are nervous about your dog traveling for the first time, or know that they're not fans of the road, your vet may be able to help prescribe something to keep them calm. How often do you hit the road with your pooch? Fruitables Snowflake Dog Treats & Cloudstar Gingerbread Men! Nom. It's holiday treat time! 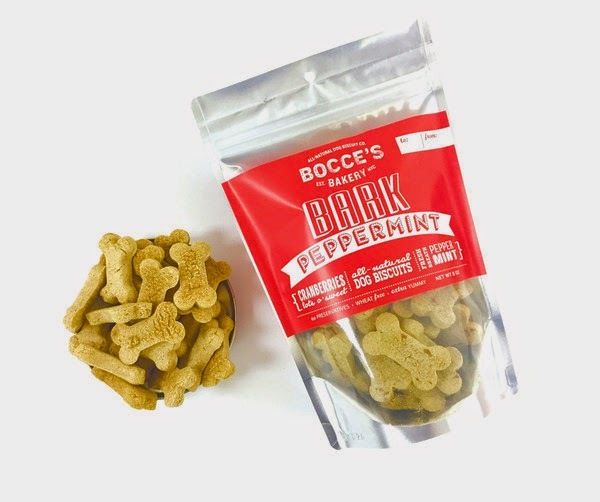 Two of our favorite brands have introduced limited edition special treats to spoil that nice (or naughty) pooch in your life. 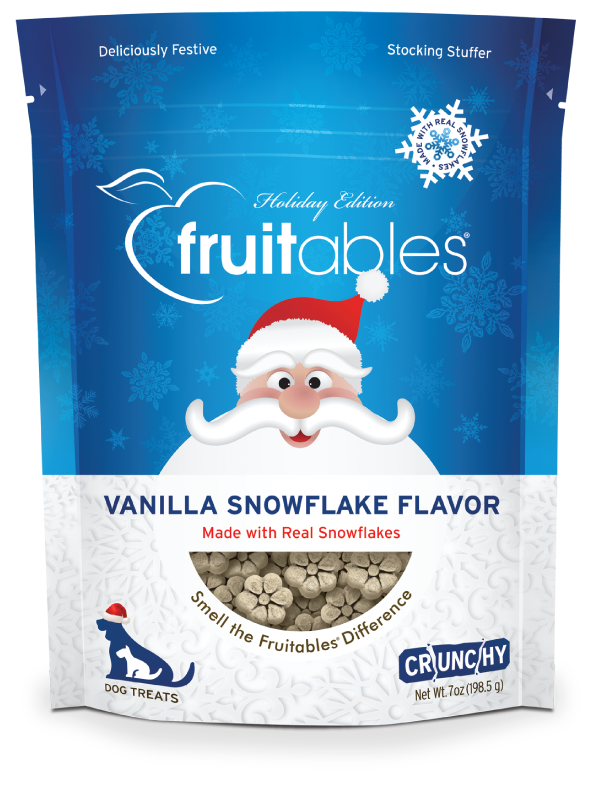 We have to admit, we're fascinated by these Vanilla Snowflake Treats from Fruitables. Made with REAL snowflakes from the Rockies, each pouch contains over 300 "sustainably harvested" (haha) snowflakes. Combined with pumpkin granola and yogurt, each crunchy treat has only 9 calories making it a more sensible indulgence. Here are the folks at Fruitables harvesting their snowflakes! 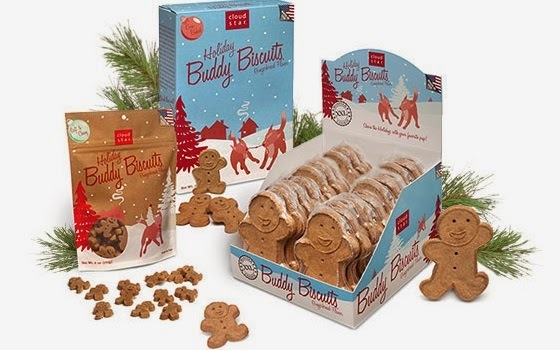 This season, the folks over at Cloudstar have added Gingerbread as a flavor to their popular Buddy Biscuit line. Available in XXL gingerbread man biscuits, soft & chewy and regular crunchy, Buddy Biscuits are made in the USA and are corn free. We are particularly partial to the giant gingerbread man, which in our opinion would make for an excellent stocking stuffer. All treats featured are available from your local pet stores and online from sites like Amazon.com. Does your dog have any favorite holiday treats?